Does your old carpeting need to be replaced? 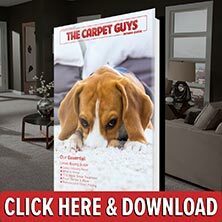 Get a free carpet installation estimate set up with The Carpet Guys today. We make installing new carpeting in a home easy, and we guarantee you will be satisfied. Ready to get your floors renovated? Book your estimate with the best place to get carpet today. Plush Carpet – With this luxurious carpet style, your formal rooms are sure to stand out. The rich velvet-like feel will please any visitor. Frieze Carpet – To give your causal styled rooms some personality, Frieze will be the perfect fit. The flair it provides is guaranteed to impress. Berber Carpet – For a family that is always on the move, Berber is the perfect style for you. It wears well and stands firm against heavy foot traffic. Looped Carpet – To add a little extra interest underfoot, our looped carpeting is sure to please you. Get it in many popular colors and patterns. Are you ready to get your floors upgraded? Get your free estimate scheduled with The Carpet Guys today! Either fill out the form on the side or give us a call to speak with us directly. Our installers are standing by, ready to install the carpeting you want most.